How long have you been in the industry? I’ve been working at Shangri-La’s Rasa Sentosa Resort & Spa for about five years. But I’ve been in the hotel industry for about 10 years. Can you tell us more about your current role and what you do on a daily basis? I’m currently an Assistant Front Office Manager, and I assist with leading and managing the entire Front Office operations. Every day, I’ll check the guest arrival and departure lists to see if there are any VIPs or guests with special requests. I’ll make sure all the preparations for special requests are in order and well-handled, and I prepare my team members for the day ahead. During busy check-in and check-out periods, you’ll find me at the Front Office, helping out wherever I can. When guests provide their feedback on their stay experience, I will also assist with resolving any issues they may have encountered during their stay. What made you interested in hospitality? I have always been interested in pursuing a service-related career. I truly enjoy making people happy and working in hospitality allows me to make people happy through service. I also find the industry to be very diverse and dynamic. It’s a competitive industry, which is a great fit for me because I am a very competitive person, and I love challenges. In this industry, we have to adapt to a lot of changes and there’s never a fixed way of doing things. As long as you have the passion for it, you’ll find that it can be very exciting. You started working after getting a Diploma in Hospitality and Tourism Management. What made you decide to further your studies and pursue a degree? Getting a degree was a way for me to remain competitive. I didn’t have the experience that my supervisors and managers had, so I pursued a degree in order to grow my knowledge and keep up. I am considering pursuing a Master’s degree as well, in the future. What do you enjoy most about your job, and the hotel industry? I love that you never really know what to expect when you come to work every day. There are no two days that are exactly the same. You never know what kind of issues you’ll face, or problems you’ll have to help out with. That excitement makes me look forward coming to work every day. What are some challenges that you have faced, and how did you overcome them? I’ve faced a lot of challenges, but I’ve learnt that the most important thing to do is to assure the guests that you are there to help them. Half the battle is won just by listening to their problems and showing that I care. Even if I am not able to provide the solution they’re looking for, the fact that I do my best to help them will make them feel a lot better. You’ve come a long way in the hotel industry. What motivates you to do your best and keep on improving? My team members. I have a great team and we constantly inspire and motivate each other to do our best. We treat each other like family, even for newcomers who just joined the team. And this family culture comes across as well when we provide personalised services to the guests. Everything we do, we do with care and concern so that the guests feel welcomed and at home. You’ve had the chance to work in different departments in a hotel. Which one is your favourite so far? I really enjoy working with the Front Office department. I think it’s the core of the hotel. At the Front Office, we don’t just help guests to check in and out. We are the ones who have the first and last contact with the guests, so we have the opportunity to set a good first impression when they first arrive and to leave a lasting positive memory when they check out. What has been your most memorable experience in your career thus far? I don’t really have any particular memorable experience, but it always amazes me when guests choose to come back to our resort for another stay. 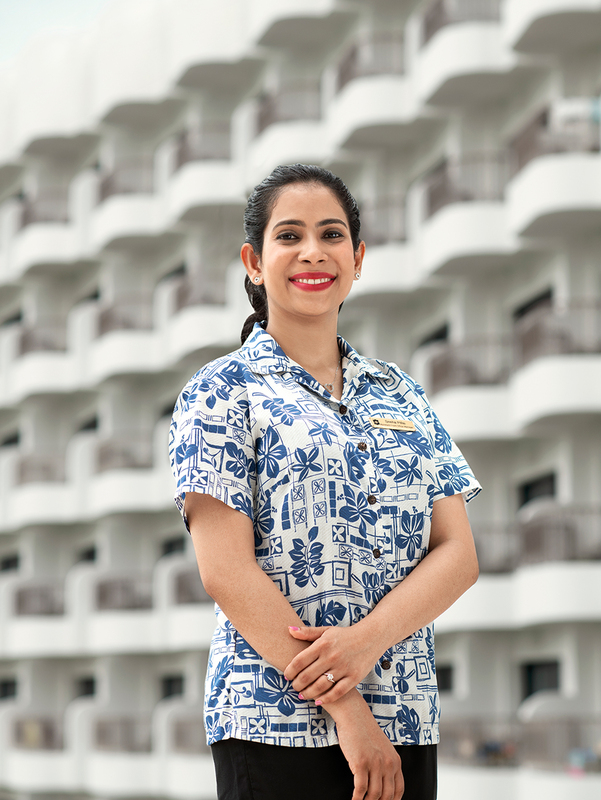 There are so many hotels to choose from in Singapore, so the fact that the guests chose to come back to see me and my team members, to experience our service again – that is something that makes me very happy and proud. Seeing a returning guest is one of the best feelings I get from this industry. Do you have any personal goals or ambitions? Yes, but it’s more of an overall goal of wanting to see how far I can go in the hotel industry. So far, I’ve received service excellence awards and the CEO Star Award in 2017. However, it’s not just about the promotions and awards. Those achievements make me feel like I’m on the right path towards success, but I want to learn and grow as much as possible. Perhaps one day I can use everything that I’ve learnt to start my own hospitality business. What advice would you share with someone who is interested in joining the hotel industry? There’re not a lot of jobs out there that keep you motivated to come back to work the next day. The hotel industry is very exciting, and you get to experience and learn new things every day.